Out Of The Blue is a fiendish effect. It features an instant vanish and an impossible location reveal that brings TV-style reactions to your everyday audience. Effect: The magician shows a deck of Bicycle cards - half are red, and half are blue. After showing the blue cards, one spectator holds onto these blue cards. A second spectator fairly selects a card from the remaining red cards. Their card INSTANTLY... and we mean INSTANTLY... VANISHES from the red deck! 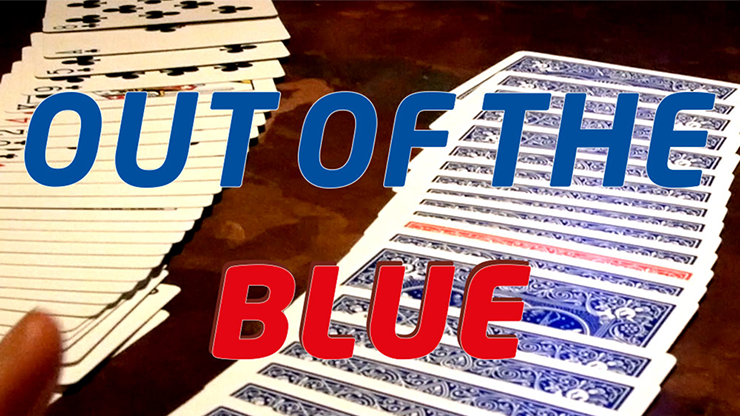 The first spectator then spreads through the blue cards that the magician has never touched, to find ONE red backed card FACE DOWN. They turn it over to reveal it is the SELECTED CARD! Created by James Anthony. Not only is Out Of The Blue simple to perform and almost self-working, it is a routine you could instantly add to your professional repertoire.